The King's Empire utilizes its global presence and strength of arms to help shape the fate of Earth. Using well-trained troops and advanced firearms, the King's Empire will give no ground. An Empire army specializes in long range firepower and cunning tactics to defeat those who oppose them. The King's Empire goes to Glory by killing enemy Fireteams, and their powerful guns help ensure this happens. They are able to use their guns in melee, albeit at a penalty, and they can even use them on the run as part of the Charge Order. This means a Squad Fireteam like the Empire Dragoons could move 20" and then shoot 14". That's a 34" threat range! It's also important not to overlook the powerful Hail of Gunfire Trigger. All of their melee and missile actions have this Trigger added to them. 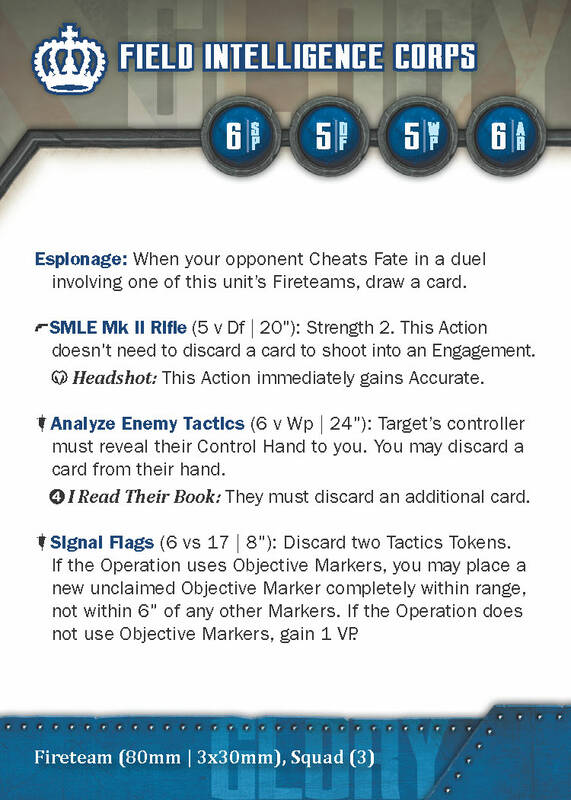 This Trigger gives out Pinned Tokens, reducing enemy movement, and cutting off Reinforcements. Charles Edmonton does not change his tune when he goes to Glory, he just gets better at it. He increases the range of those near him. He gets better with his gun. Charles knows what he is good at, and capitalizes on it. Margaret is fast. It's part of what makes her such an effective spy. She is able to easily move around the battlefield. Her Poisoned Knife lets her cut through squads or Commanders with equal ease, cutting the enemy down in a blur. When she needs to, Margaret dials it to eleven. Backstab can shut down a target between denying Cheating and adding a Shaken Token, opening them up to an absolutely brutal knifing. It is not an activation you'll soon forget. Going to Glory, Margaret adds new triggers to her actions, ensuring that they will end her foe. This includes the ability to take a particularly pesky combatant out of Glory, making its demise all the more likely. Belle also adds one new Action, allowing her to draw two cards. Sometimes, there's nothing to Backstab, and this handy action can be a mid-turn boon. Infiltrators are the cheapest Squad available to the Empire. Their ability to deploy anywhere on the table is a nice advantage in many situations. Their Pistols are not powerful, but can still put out damage as needed. Confuse is a situational action, but can be very powerful in the right context. For example, you could make an enemy discard a hard-won Reinforcement Token, replacing it with a Shaken Token... making them more likely to fall in the future. The Royal Rifle Corps are the most expensive squad in the King's Empire. Their CLLE Rifles have a great range and Strength, and a trigger that can make it easier for each other action to hit. This is the core of their place on the battlefield, but they have other options to boot. "Together, Now!" gives them a Reinforcement and an Inspired Token, helping them stay effective on the battlefield. Conversely, they can use Noble Procession to draw cards (and possibly give Inspired Tokens), ensuring others are more effective in the fight. 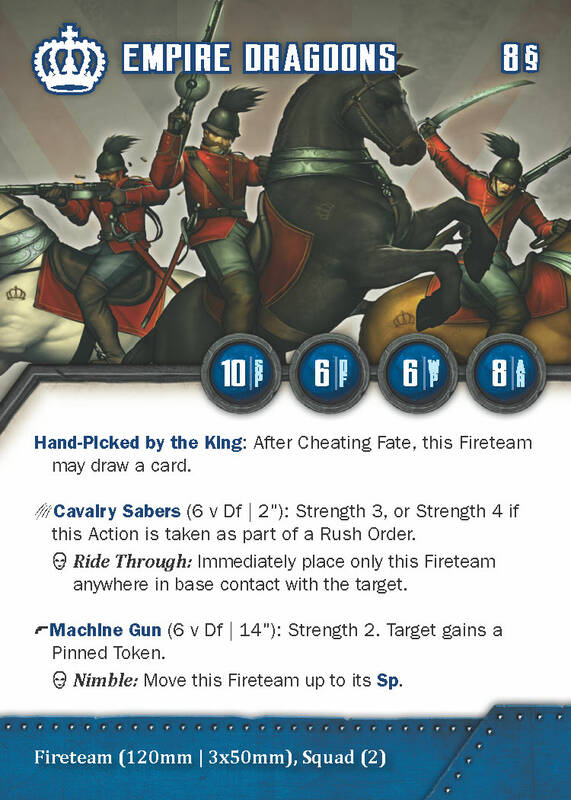 The Empire Dragoons are a fast cavalry force, able to strike where their enemy is weakest. Bringing a devastating melee attack and a good ranged attack, this unit will exert pressure just where you need it. As you can see, this Squad only comes with two Fireteam bases of three models a piece, but they pack quite a bunch. Strength 6 on melee makes them able to chop through anything. 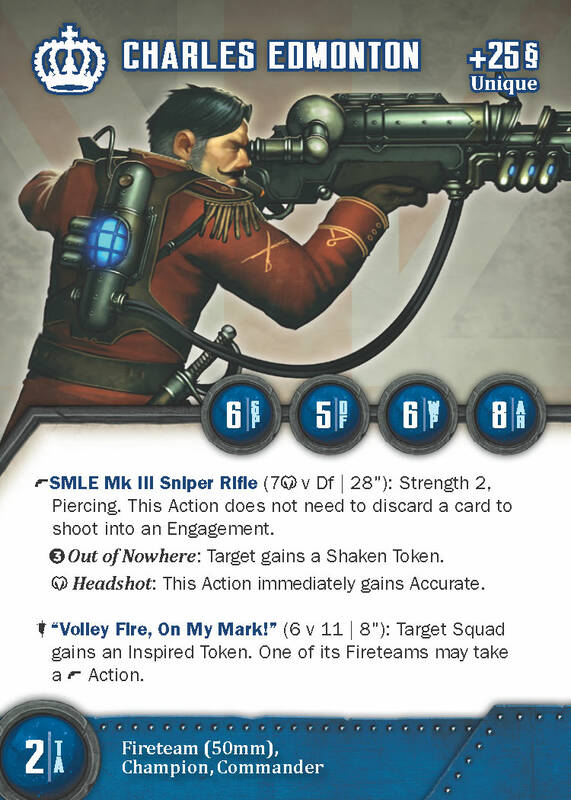 Hand-Picked by the King helps maintain a card advantage over the opponent, and their Machine Guns ensure they'll always have a target (they are Speed 10!). 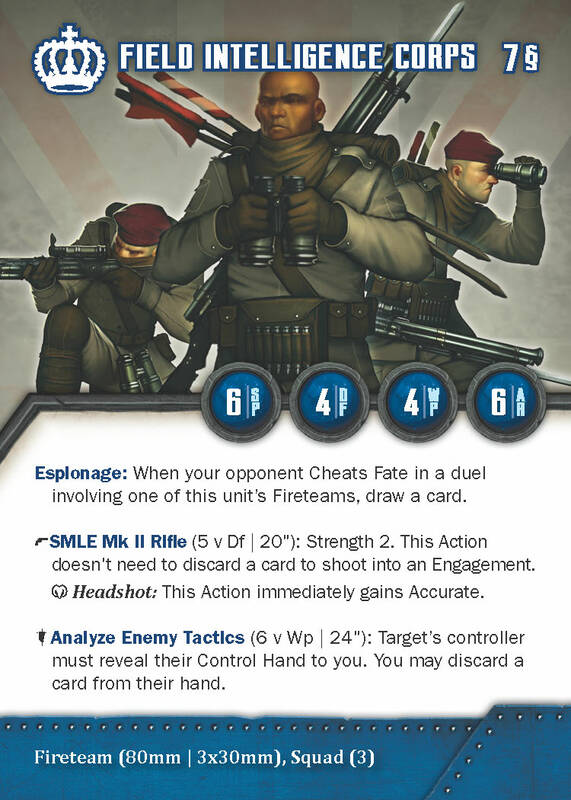 The Field Intelligence Corps may not be the deadliest soldiers of the King's Empire, but they excel at disrupting enemy plans. They are able to force enemies to discard cards from a massive range of 24". Once they go into Glory, they are also able to place new Objective markers, which can swing the game drastically in the favor of the King's Empire player. The South Wales Borderers like to punch. It's what they live for. Their Steam Powered Fists are quite powerful with their Open Wound Trigger. Their Reserves Ability and 5 man Fireteams mean they will be sticking around for a while to be able to get more punching done. Remember Our Mates means that while they wait on some Reinforcements, their Punching Power gets even greater. Grenadiers excel at hunting both Titans with their high Armor, and grouped up enemies with their Area attacks. Their High Yield Trigger on Grenade Launcher and built in Piercing on Rocket Grenade means that when they hit they can dish out some real hurt. When they flip to Glory they become even more adept at hunting titans, with their Titan Hunter ability rewarding them for flipping Assets on titans. The Motor Scout uses Fast and Lightweight to be able to speed around the field, gaining Inspired Tokens, making it easier for them to use their Machine Gun to kill a Fireteam to go to Glory. Once they are in Glory they are able to summon even more Motor Scouts. The Artillery Team excels at taking down High Armored targets. Their 48" range means that they will be able to often take the Focused Effort order for an Inspired Token to help counteract that low AV of 3. They especially excel at taking down Titans with their low Defense and high Armor. The Sharpshooter Adjunct makes its Fireteam more powerful with a +1 AV to all of it's Actions. It also provides a powerful Long Rifle shot. This will be a powerful addition to any Empire unit. The King's Hand is a massive Titan built for war by combining the knowledge of the Guild with British manufacturing. Taking advantage of high levels of technology, the King's Hand is able to have advanced Targeting Parameters. This makes sure it hits its target when firing into an engagement. It adds to this its Superheavy Gatling Gun. Though this gun's Strength is only a 3, its impressive AV 6 and 18" range means that many shots will connect. The Powerful Shot Trigger also increases the gun's Strength more quickly than the standard Margin 5 that other attacks need.